Tacoma's premier personal training facility for women. Since 1977, Total Woman Health Studio has been providing quality programs & services with superior facilities as a women's gym in and around University Place. We hope you enjoy our website and will stop by and visit us if you are in the area. This site is designed to give you information about our amenities, our services, our staff and provide you with information on how to contact us as well. Please click our Facebook or Blog links below for additional news or deals! Whatever you're looking for in a woman's health and fitness regimen, you'll find it here. Our gym combines a full range of fitness and exercise equipment tailored to women. We offer professional trainers, personally tailored programs, and group health and fitness classes. You can access as many or as few of the organized programs as you choose while still having use of our extensive equipment. 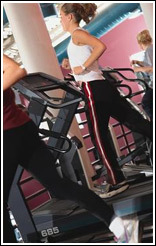 Our club also provides a friendly, comfortable, motivating and energizing environment for your physical activities. Your fellow members and our trained professionals are both on hand to guide and support you. 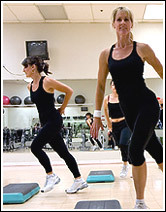 If a class atmosphere works for you, we offer dozens of regularly scheduled fitness and exercise programs. We also provide the solution to a common stumbling block to regular exercise: The Weather! Here you can exercise whenever you choose without regard to outside temperature and humidity. Our club is also a safe place to exercise featuring an accredited emergency response plan and employees trained in CPR and first aid. Regular exercise improves your health in a number of ways. When performed on most days of the week, regular physical activity reduces the risk of developing such things as high blood pressure and diabetes and reduces your risk of dying from heart disease. Not only does regular exercise help control weight, it also helps build and maintain healthy bones, joints and muscles as well as promote psychological well-being. You can contact us through Direct E-Mail or our Contact Form . You can also call us on the phone at: (253) 565-7546. Please refer to our Hours of Operation to call us within our business hours.